Radio silence has a purpose: to NOT broadcast. To NOT be heard. When I’m deep in the development of new work – in that juicy all-things-considered Gathering stage – I need to power down, STFU and just attend. To go deep with what discoveries arise, to ask more penetrating questions, to move my hands in concert with the answers when called by curiosity and technical wonderings. To remain programmed to receive, a witness to the What If, perhaps a mirror of it as well. Holding one’s wise fire in silence is the tonal and behavioral opposite of marketing, promoting, sharing & networking, and it is therefore as difficult as abiding a few days with a nascent engagement. Our times encourage constant bleating, opining, ‘splaining and newsiness. Believe me, with ten years of blogging in the bag, I wondered as I wandered through the weeks and months of radio silence if I should just ignore my gut and instead be chatting this new stuff up. Fortunately, nothing of sufficient coherence spurred me and I was not Scheherazade facing death at dawn, either! Just what *this* was remained inchoate, standing in the wings, resolutely waiting for its cue. For me, the worst thing I could do would be to write with nothing clearly meaningful to say, even though a quick googling assumes that one can and even should do exactly that, the better to garner the hits from buzzy eyeballs. *Sigh* I have to believe otherwise. Must be time, though, because the word and image descriptors for whatever it is that I’ve been doing in my cocoon, lo, these many months, stepped boldly into their spotlight and began chewing the scenery. This arose unexpectedly during my annual Studio Re-dedication, a loose round-up of the past year and a sneaky glance forward which I orchestrate sometime each December. Heart and Soul counts most here – ritual does not – but I always seem to include flowers, music, candles, aromatics and a clutch of handy works representative of the edge of my creative stretch. Never mind that I needed to kick a fire lane in the overgrown studio jungle to clear off just a couple of square feet of horizontal space. It didn’t matter that my honest focus lasted maybe 15-20 minutes and that, for the first time ever, I felt the whole thing a little silly. Never mind! Just show up, they say, and the Muses will do the rest. Which they certainly did. • You can see from the photo that I’ve been playing with fibers and clay. (Knitting my fool head off into the wee hours would be more to the point!) 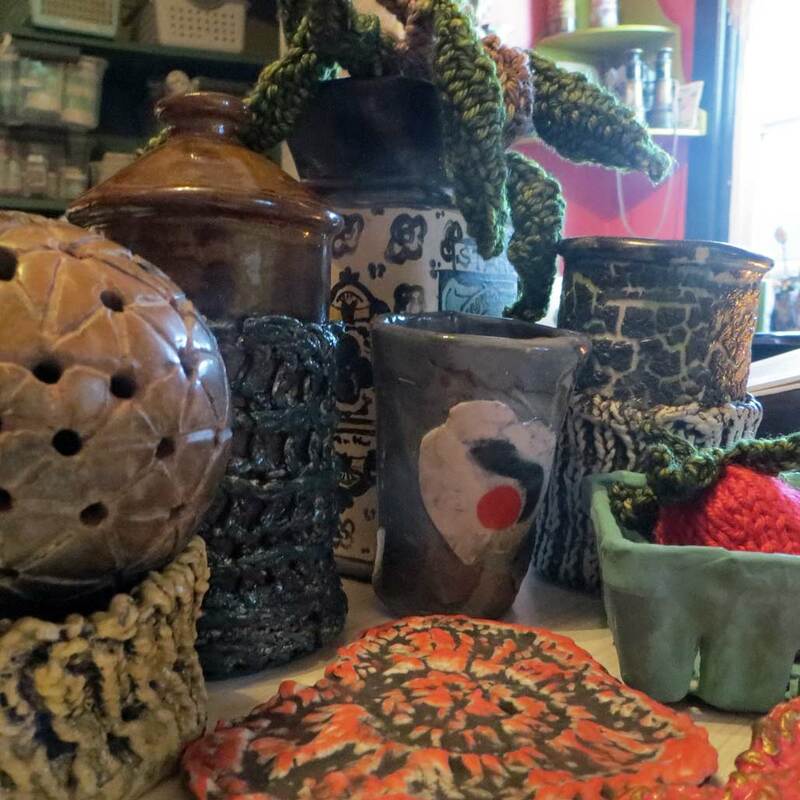 Mining my existing ceramic pieces to riff off of and designing new ones to complement the shapes and colors of the delicious handpainted yarns I covet. I have always wanted to combine knit/crochet and ceramics in more than just a doily impressed into a soft clay slab for texture. But until now, every previous foray in that direction led me to the realms of the obvious: the cute, forced and funky. No bueno. • But within my quiet cocoon that quest expanded into a profound clay/fiber conversation of shapes, colors, narratives, objects. Clay can be made into all manner of receptacles, but so can fiber. Clay can copy fiber shapes and vice versa. Shaped fiber can be dipped into liquid porcelain, dried just so and fired, transforming it into fiber-shaped clay. Case in point: only the strawberry and olive branch in the photo above are fiber, the others used to be. I have only just begun on this journey. • Inspiration and a certain sort of Full Circle healing came in these months, too, when I returned to Cabrillo College Ceramics as a TA in Beginning Handbuilding for the Fall Semester. Things there – physical, cultural and spiritual – were ultimately right where I left them six years ago when I was called away to my own solo practice. Giving support to the sweet and funny learners, sharing the jolly collegiality of peers, exploring my personal response to the projects, (ask me about coloring and patterning my clay to go with my hand-dyed yarns!) all conspired to help me appreciate how I have grown and prospered and to take note of my roots. •Have you heard of Yarn Bombing? Seen any? It’s been a thing for awhile, but I’ve personally not seen it in action. Basically it takes the fiber arts to the streets as a form of soft graffiti. Knitting as political and/or humorous badassery. I’m in! I have ideas about clay works covered in yarn, or yarn shaped with clay tags, or … This is the spirit for which I yearned when I first sought a tactile conversation between these two loves of mine and I see it headed my way. • Speaking of the fiber arts, it’s not lost on me that knitting gets as little respect as clay for being a fine art. Will combining them double down on that crafty discounting, consigning me to a dual oblivion of my own making (pun intended?) I guess I should care, but it has also come clear to me in my caterpillar soup swim, that it serves no purpose to ponder such things. That is for the Ages to determine and, besides, it won’t change my fascination and pursuit one stitch. –Liz Crain, going quietly where she has not gone before, stepping away into time out of mind, daring to digest herself and emerge with a description. Yes! We all have them…but we have been taught to fear and deny instead of enfold and abide…SO glad you’ve tucked it away to savor, Jan!